A few days ago my family returned from a vacation to California. Our boys are old enough now that they’re out of diapers, don’t need us to plan our schedules around nap-time, and only fight with each other, run into the street, or climb on things they’re not supposed to 47% of the time. I’ve actually felt like a real person again for several years now! Those early years were pretty rough. For most of our vacation, we had a great time, our schedule filled by swimming in the pool, playing at the beach, eating great food, and fulfilling every young boy’s dream: going to Legoland! But several days into our trip, the better part of one one afternoon involved me being in a pretty sour funk. Here I was with my beautiful family, but I just couldn’t handle one more hour at the zoo. Once the initial fog of my grumpiness lifted (it took longer than I want to admit), the problem became more clear to me: I was a fraud as a father. Why couldn’t I pull it together? I like my kids. I’d been looking forward to this time with my family. So, where was my sense of joy? For heaven’s sake, I’d written a master’s thesis on fatherhood. I hold two degrees with the word “family” in the title. I’ve been practicing as a Marriage & Family Therapist for nearly 15 years. Where did all the supposed wisdom from those years go? 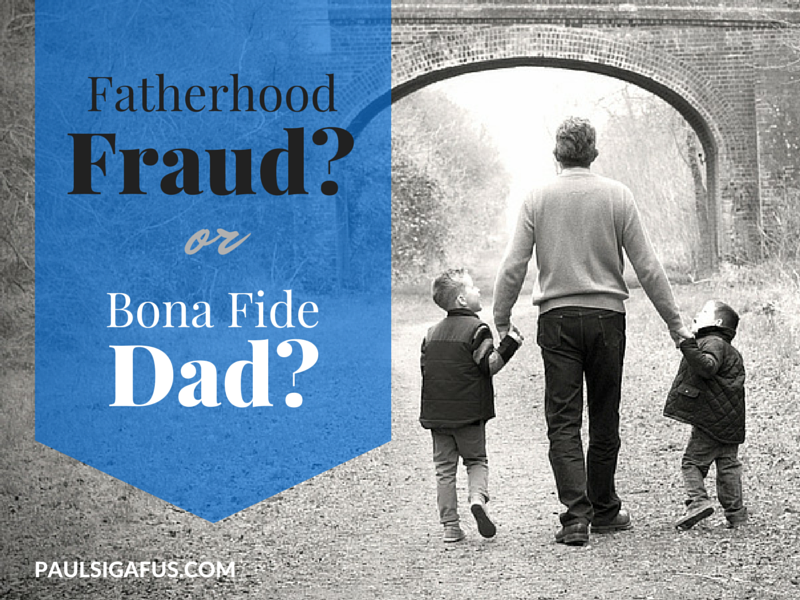 I confided in my wife about my feelings of shame, and my suspicion that I was a fraud as a father. I shared with her my sense of being pulled in two directions: the better part of me thrilled to spend time with my kids — but the lesser part of me resented it. I’d unrealistically thought that our vacation would afford me an hour or so of quiet time each day to work on my writing. Ironically, and increasing my sense of shame, I was planning on using my writing time to draft a blog post—catch this—on fatherhood. Good grief. As a friend of mine observed, the thing that got in the way of me writing a blog post on fatherhood was actual fatherhood. Thank God for my wife, who invited me back into a sense of perspective and a sense of humor. As I confided in her my sense of being a fraud as a father, she reminded me that all of us have more than one passion, and that probably all parents struggle with the tension between loving their kids and needing some time for their own personhood. She said that, when I found time to write, maybe this very experience was exactly what some dads out there need to hear. I honor you. I honor you for the burdens you carry and the efforts you make. I honor you for cherishing your children, and loving their mother. I honor you for how you try to impart joy, wisdom, love, and courage to your kids. I honor you for your desires to get it right with the people who matter most. Yet, you’re just human after all — you may struggle at times with the sense that you’re somehow falling short as a dad. It’s a terrible feeling, isn’t it? My greatest source of shame comes when I feel like I’m letting my family down. Maybe you feel crunched for time, low on energy, or thin on patience. Maybe you really have let your kids down in some way. However large or small your failings, they probably hurt precisely because being a good father means so much to you. There are lots of us out there, just like you. You’re part of a great, worldwide brotherhood of men, who, like you, are imperfect but striving to bring up our children in a good way. Like you, we’re working on improving. We’re getting up in the middle of the night with our sick kids. We’re trying to shoulder our many responsibilities with as much grace and energy as we can. We’re teaching our children what we’re coming to understand about life and love. We’re failing at times — and we’re learning how to laugh at our mistakes, and how to reconcile and reconnect in a meaningful way with those we’ve let down. We’re also becoming the very best kind of teachers, using our own human struggles to teach our children about resilience, courage, compassion, and forgiveness. Keep the faith, fathers. You are deeply needed, and very much appreciated. What have you learned about fatherhood? What do you appreciate about your dad? Feel free to leave a comment below! Paul, I think all parents struggle with the issues you so clearly articulated in the blog – both mothers and fathers. It is a constant struggle with polar opposites attracting us to be with our kids and be good parents to them and then to actualize ourselves with other talents, interests, work or whatever that may be. The fine balancing act is a challenge for all of us. I think normalizing this for parents so they do not feel so guilty is a great service to them. This can begin an ongoing conversation about the struggle to be good parents while at the same time also pursuing other important interests in our lives. This is a great ongoing discussion for all parents who deal with this balancing challenge. So glad you brought this up. Well said, Hildie! I hope that this will begin an ongoing conversation — I think it can really help us integrate the different important parts of our lives. Be well! I’m excited about your new blog and I really enjoyed this post. Your vulnerability and honesty is as helpful as it is inspiring! Thanks, Jim! As a fellow father, I’m glad that you enjoyed the article. I’m sure we can support each other in our onward journeys! Paul, this is an amazing post! Your willingness to share your struggles with walking through this sometimes overwhelming journey that is fatherhood shows your maturity and passion for doing whatever you can to help families! I will be sharing this with my husband who has also expressed the EXACT same feelings to me about living up to his role as a father. I’ll let you in on a little secret, the fact that you are so concerned about being the best father you can be, means you are an amazing father! Happy early Father’s Day! Thank you for your kind words, Erin! I hope your husband found my post encouraging as well. I really do think that there are so many good dads out there, and we benefit from knowing about each other’s experiences — the struggles along with the successes. Stay well! Thanks for sharing Paul. Your thoughts this Saturday morning has started me down the path of reflection on Fatherhood. It usually doesn’t happen until the end of Sunday–and there was so much I needed to say. I might actually be prepared on what to say to my kids and my father when we speak. Thanks, Michael! I’m glad my post inspired some reflection — sometimes I get caught up in the busyness of life, and I need reminders to slow down and consider things in a different way. Hope your conversations with your kids and your dad went well! Great thoughts Paul, often we have to beat ourselves with the guilt stick to remember our duty and to try to be better. I have older kids and I’m constantly asking myself how I can do better each day as a father and a grandfather. Basically it is never an easy challenge because of the many dynamics, but, like you, I have a great wife that reminds me when one of the spinning plates in my life is wobbling. All the best! Aren’t we lucky to have people in our corner, who can be honest with us and remind us of our better selves?! I’m with you — becoming a better father (and grandfather, though that’s a long ways off for me) is a daily opportunity, and because it’s challenging it also offers great potential for growth. Thanks for sharing your thoughts! You have always been your hardest judge since I met you. You’re a good dad I have no doubt! Just concentrate on having fun with Carly and the boys. The writing can come later. The boys are going to grow up way too fast. Don’t miss anything. I’ve been exposed! But it’s true, Patty — I do tend to be my own harshest judge. And being with my boys is definitely more important than writing; like most people, I’m trying to find the balance. Good to hear from you! Thanks for sharing such an honest and powerful story. I find I have the same struggles as a mom. I needed to read every word you wrote. What a blessing! Thanks, Danielle! We’re all in this together, aren’t we? I’m glad that you found some encouragement in my story. I think we all need that as parents.